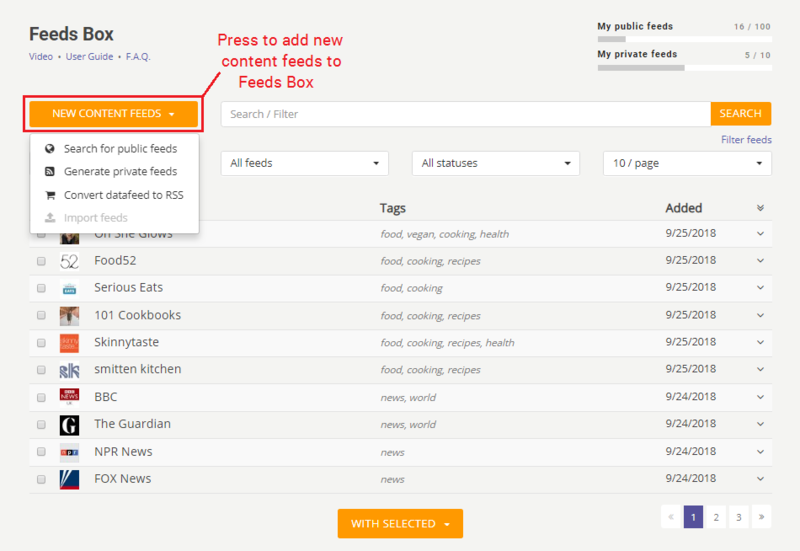 Feeds Box - is a collection of all content feeds ever searched or generated in RSS Ground. When you generate new private content feeds or search for public content feeds you can simply save them to your Feeds Box. 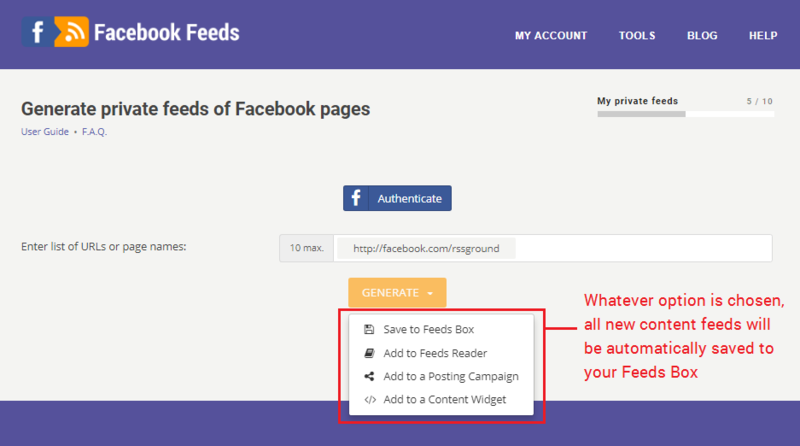 But even if you choose to add your feeds to a posting campaign or a content widget, send them to Feeds Reader, they are still automatically saved to your Feeds Box. In Feeds Box all content feeds are saved chronologically, starting from the latest. You can search your content feeds using keywords. Content feeds will be searched by title, description, URL, tags or content source. 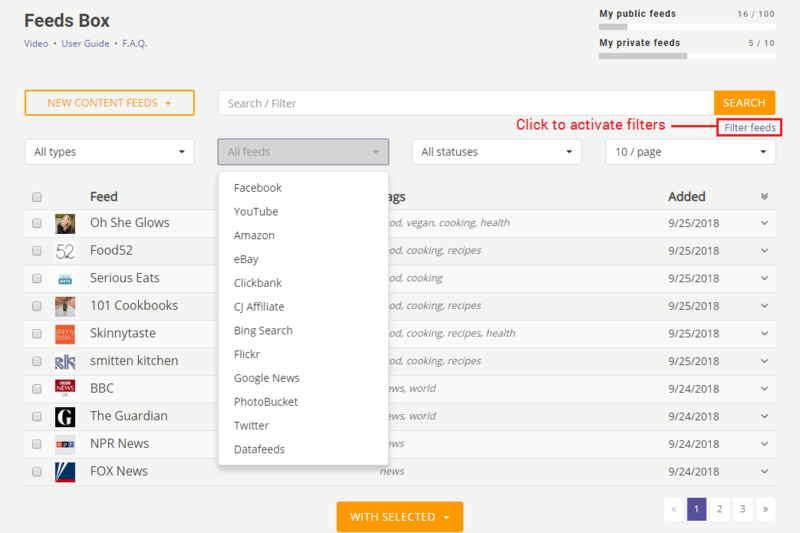 By types - filter private or public feeds. By sources - filter Amazon, eBay, Google, Facebook feeds etc. By status - filter active or inactive feeds. Read more about feed statuses. Press Filter feeds to use one or several filters. To see full information about a content feed you need to expand feeds record. Each feed has a title, description, related tags, and source URL. 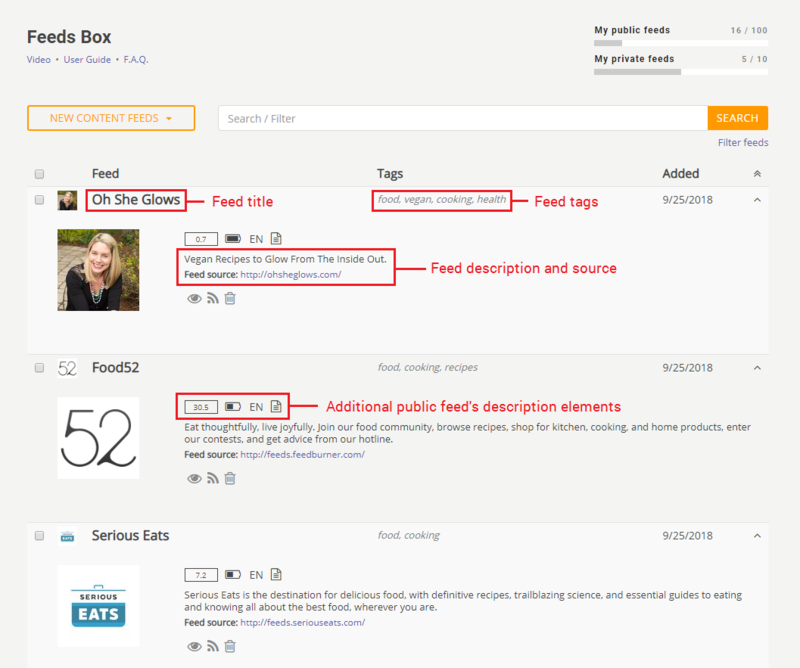 Public feeds will also have additional information about how often this feed is updated, does it have a full-text description, what language this feed is in and what type of content does it contain. 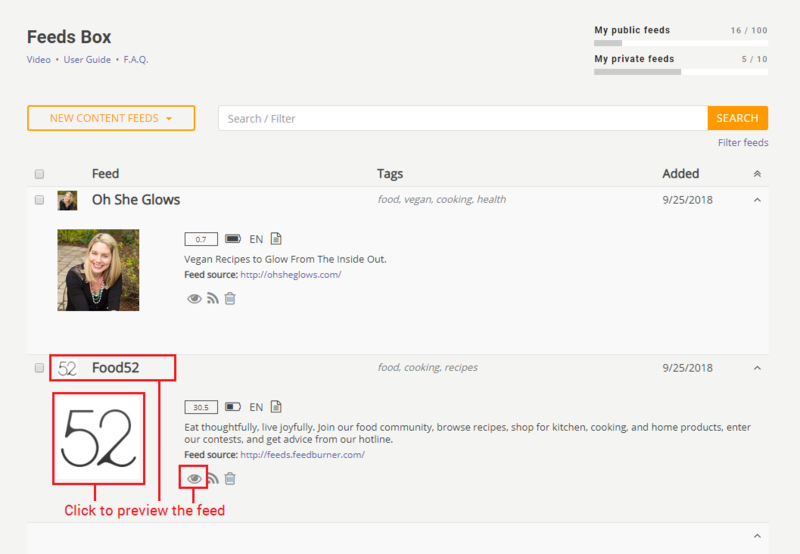 To preview feed content click its title, image thumbnail or preview (eye) icon. Titles only mode - shows only titles of all feed's articles. Magazine mode - shows a digest (image and short description) all feeds articles. Full view mode - shows all available information on each article. Not all feeds can be displayed in full view mode. Click on news title or use 'View original' icon to go to the original article's page. 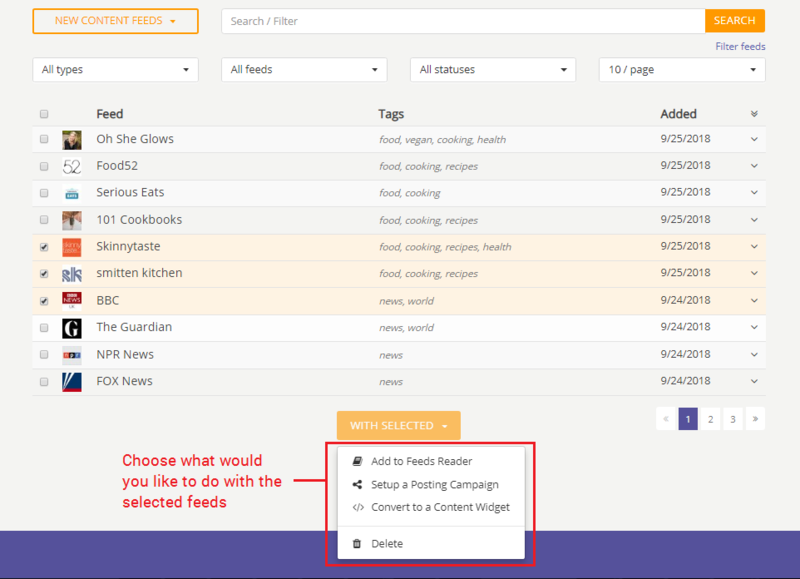 From Feeds Box you can add your content feeds to existing posting campaigns or content widgets, or create new ones. 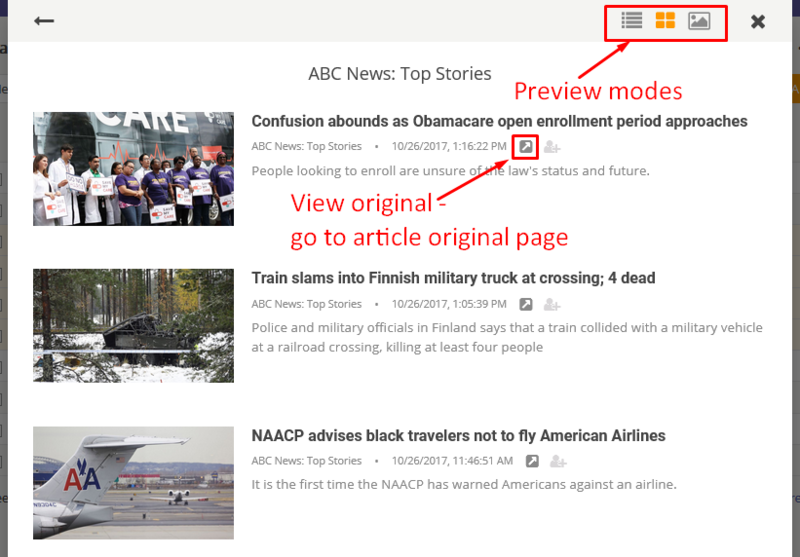 You can also send your content feeds to any category of your Feeds Reader. Select content feeds and then press WITH SELECTED button. Now choose an action you need. If you wish to add your content feeds to any existing posting campaign or to any existing content widget you need to add them manually. Go to feed' expansion area copy its URL and then go to a campaign's or widget's editor. Use Delete option in expansion panel to remove a single content feed from your Feeds Box. To remove a group of content feeds use WITH SELECTED option. 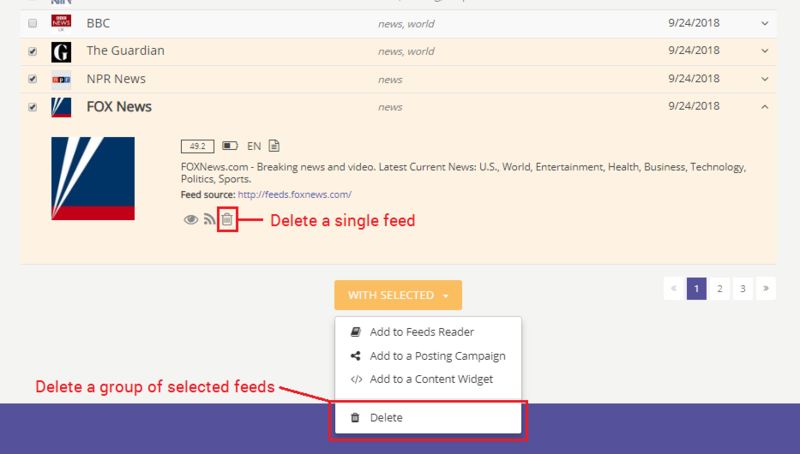 Don't delete content feeds from Feeds Box if you're still using them in Feeds Reader, in any posting campaign or in any content widget. Otherwise, these feeds will be removed from there, too. To add more content feeds to your Feeds Box press ADD MORE FEEDS button. Choose what type of content feeds you wish to add from the drop-down menu. Watch a separate video on how to get new content feeds in RSS Ground. 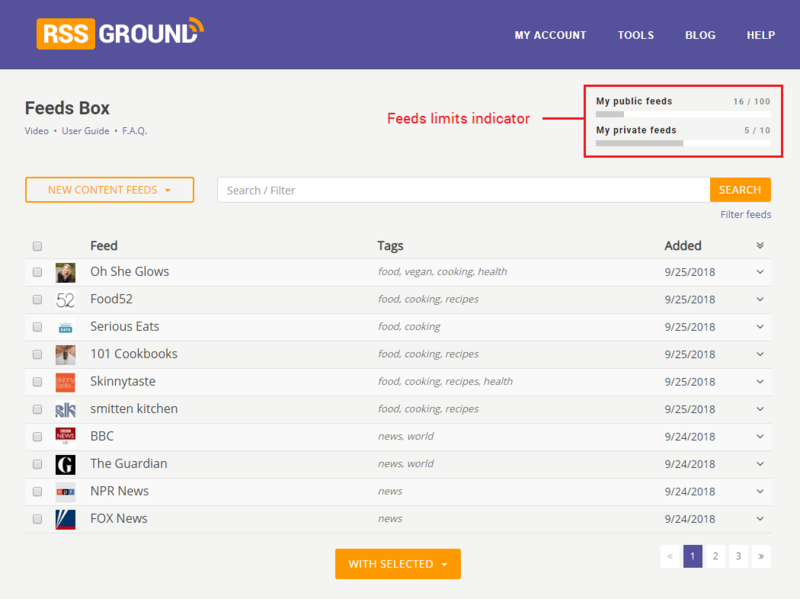 Each membership level has limits on the number of public and private content feeds saved in Feeds Box. Pay attention to a limits indicator to find out how many feeds you already have and how close you are to your limit. You won't be able to create and add more feeds to your Feeds Box as soon as you hit the limit. To be able to create and save more content feeds you need either to upgrade your membership plan or to delete unnecessary content feeds from your Feeds Box. But be careful deleting feeds from Feeds Box. Don't delete content feeds if you're still using them in Feeds Reader, in any posting campaign or in any content widget. Otherwise, these feeds will be removed from there, too.